Decaspermum fruticosum, a tree with weapons grade hard wood and healing properties (Myrtaceae). through PROTO POLYNESIAN *Nukanuka, Decaspermum fruticosum. Possibly ultimately from Proto Malayo Polynesian *Nuka, "sore, wound". 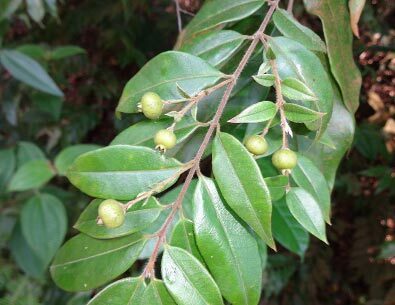 Tahitian: Nu'anu'a (Decaspermum fruticosum, Myrtaceae); 'Anu'a "A tree with hard wood". Maori: Mānuka (Leptospermum scoparium, "Tea tree; red mānuka", & Kunzea robusta, Myrtaceae); Kānuka (Kunzea robusta, Kunzea ericoides s.l., "Tea tree", Myrtaceae); Mānuka rauriki (Leucopogon fasciculatus, "Mingimingi", Ericaceae). Māori: Mānuka "troubled, anxious,sad", from Proto-Tahitic *Mānuka "trouble, anxiety", ultimately probably also from Proto Malayo Polynesian *Nuka "sore, wound". All these trees whose names incorporate the word root *nuka seem to have in common a hard wood, suitable (and used) for making durable tools and weapons, while also possessing medicinal properties. Most belong botanically to the family Myrtaceae, and therefore have discernable similarities in their flowers. The morpheme nuka itself probably echoes the Proto-Austronesian word *nuka, "wound", an appropriate reference to both the medicinal properties of these trees, and the fact that the wood of most, if not all of them, is highly suitable for making spears for hunting and weapons of war. The possible Rennellese cognate for Mānuka is included in the lists above because it seems to incorporate the prefixed word formative ma-, which could indicate that counterpart Māori name has a Proto-Polynesian origin. I have not been able to find any specific inflormation about the plant to which the Rennellese name refers, but the closely related Altonia scholaris, which grows in Southeast Asia and parts of the Pacific is a tall forest tree noted in Indonesia and Papua New Guinea for its medicinal properties. The link with Rennellese is very tenuous, however -- the nuka element may possibly be shared, but the Rennellese word itself is most likely an independent invention. 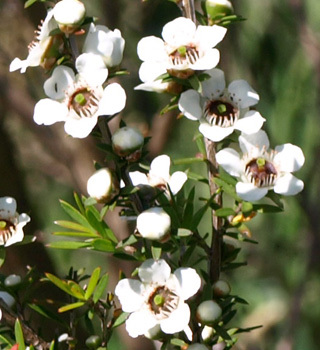 The Pollex database records mānuka (Leptospermum scoparium) as a Rarotongan word shared with NZ Māori; however apart from apparently unsuccessful attempts by gardeners to grow it, a Cook Islands form is known only from a specimen gathered by the New Zealand botanist T. F. Cheeseman in 1899, with he thought “doubtless introduced”, although he had no evidence of this as the plants he found were apparently wild. 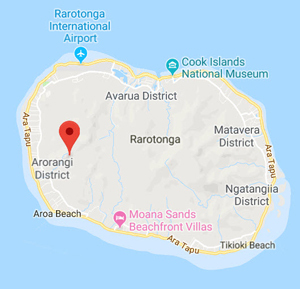 He found it in only one location, thought to be Raemaru on the slopes of Maungaroa, Aorangi District (see map), but it hasn’t been reported since. Although Rarotonga has a land area of only 67.39 sq. km. (for comparison, Hamilton City in Aotearoa has 110 sq km, and Waiheke Island 92 sq. km. ), this mountainous area is almost inaccessible, and has not been searched for evidence of the survival of this plant since Cheeseman found it there. It is treated by the Cook Islands biodiversity database as extinct and exotic. The alternative meaning of the Māori word mānuka (with cognates in Tahitian and Tuamotuan), "troubled, anxious, anxiety", may well ultimately come from the same source as the tree names, the Proto-Malayo-Polynesian *nuka, "wound", by a similar series of semantic transformations -- wound >> tree with wood that enables both inflicting and healing wounds, wound >> the state of mind resulting from physical or psychological wounding. The derived form Kānuka may have originated in Tahiti; it is not clear which tree the apparent Tahitian cognate of the Māori word refers to: it is simply listed in the missionary H.J. Davies' 1851 Tahitian Dictionary as "Anua, s. The name of a tree with hard wood"; it is not included in the more recent Wahlroos Dictionary. The nuqanuqa (also widely known as nuqa, and niqwa in parts of Western Fiji) is a moderate sized tree found at the edge of the forest, particularly in dry, rocky places, and also cultivated. 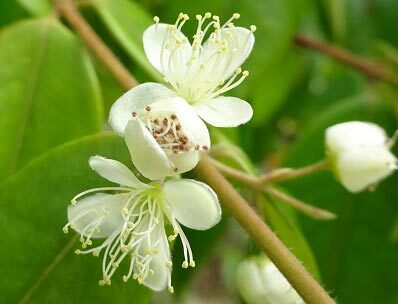 It is endemic to Fiji, and as small round pointed leaves which give off a pleasant smell when crushed,small black berries, and small white fragrant flowers. The nuqanuqa is also medicinal; an infusion of its leaves, with the leaves of certain other plants, is said to cure diabetes, the bark makes a poultice for piles, and an infusion of its root, with root of vobo, is said to cure cervical and breast cancer. 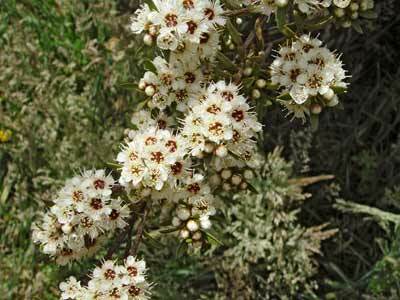 Rhys Gardner describers it as "much like our two species" of the Myrtle family (Leptospermum scoparium and Kunzea ericoides s.l. ), "in its small, ovate, oily-scented leaves and regular white flowers" ("A botanist follows a linguist ...", p. 29). Of the New Zealand plants that have inherited these names, only the mingimingi (Leucopogon fasciculata) is a little puzzling, in that Mānuka rauriki literally means "small-leaved mānuka" -- it's leaves are certainly not small in relation to those of the New Zealand Mānuka. However, the reference could be directed back to Polynesia, ironic, or motivated simply by the fact that from a distance the mingimingi certainly does look like a mānuka or kānuka. There may well be something in traditional accounts, uses or poetry which will shed some light on this mystery. Since there are no Decaspermums in the New Zealand flora, the other mānuka seem good candidates to inherit these names. In Aotearoa, the word mānuka is a generic term in the north of the country, refering to plants hitherto classified as Leptospermum scoparium, and also (in some districts by default) to those which had been grouped by botanists under the specific name Kunzea ericoides, also commonly referred to as Kānuka, or in the East Coast region, as mārū. The Kunzea group has now been divided into ten separate species, of which Kunzea robusta is the most widely distributed, and research is under way on Leptospermum scoparium, which may result in the establishment of three distinct species; like the Kunzea species, all the New Zealand varieties of Leptospermum scoparium are endemic to Aotearoa (there is more information about this on the pages for the Māori plant names Mānuka and Kānuka). Further information : You can read a botanical description of Decospermum vitiense and D. fruticosum, along with information about the genus as a whole, in A. J. Scott's paper, "The Austral-Pacific Species of Decaspermum (Myrtaceae)" (publication details for this and other works mentioned above are in the Bibliography). See also the NZPCN web site, and the pages linked above, for more information about mānuka and kānuka. Photographs: The photos of Decospermum fruticosum are by the Singapore-base photographer Kwan, © www.NatureLoveYou.sg, that of Kunzea robusta is used courtesy of Peter de Lange, NZPCN, and that of Leptospermum scoparium in flower by R.B., Te Māra Reo.